Tonight on CBS, Survivor: Guatemala gets going at 8p (Shameless plug: Watch for Vito's Survivor 11 in 99, debuting tomorrow on TVGeekspeak.com). Oh, and over on Comedy Central the surely snarky Showbiz Show with David Spade bows. Yippee. I had a friend in college who used to write a column for the school newspaper. One week, he was stuck in a rut of writer's block and just began rambling about daily life on campus. He began by talking about one of the lunch ladies in the dining hall that always had a nasty look on her face. Even though I'm in the same predicament, I'm going to spare you my collegiate memories and try to remember what I've seen on the tube this summer. I can tell you this: it wasn't baseball. I guess it's capitalism in it's more refined form that has dictated the national pastime be relegated to regional importance. Folks living 90 miles from Washington D.C. can't watch the Nationals on TV. People living in New York City couldn't see the Mets for a time either. And now, in the second week in September, I guess it doesn't really matter much with the NFL starting, does it? People will ask me from time to time what is it about football that captivates the national consciousness. They operate on the premise that less is more. By playing just once a week, they guarantee at least 6 days worth of hype, hyperbole, and hedging bets on every game from the marquee matchup to the dregs of the league. Baseball plays every night, so one game is forgotten in a matter of 24 hours or less. Football gives you time to brood or rejoice, depending on your outcome. Plus, unlike baseball, you have a pretty good chance of seeing your regional team each and every week. It's not like baseball where you get the Braves and the Cubs and that's about it. Can you imagine if everyone had just the Falcons and Bears to watch every week? No the NFL, even with its blackout rules, always tries to make sure their fans are taken care of if they can't get to the games. Yet another reason why our interests cross over from baseball right about this time every year. And I know this will fall on deaf ears, but if Bud Selig could PLEASE start World Series games before 9pm Eastern, he might just get more folks interested. An 8 year old can't stay up to watch the end, and come to think of it, neither can I. I'm in a food coma from passing the lunch lady 4 times today. Gotta love those buffet lines at the dining hall. I think I got her to smile once. Buffy The Vampire Slayer creator Joss Whedon says he is bringing back Spike- the bleach-blond, British-accented vampire and Buffy banger- for a TV movie. Sarah Michelle Gellar says she's not interested in reviving her Buffy character for the flick- or anything else. Feh. No Gellar? No good. Former Tony Danza sidekick and Apprentice contestant Ereka Vetrini has been hired to be a contributor to Court TV's Hollywood Heat. Vetrini was somewhat unfairly axed from her gig at The Tony Danza Show earlier this summer in a shake-up at the squirm-inducing gabfest. The show now goes sidekick-less. Hollywood Heat airs Thursdays at 11 p.m. and is hosted by A.J. Hammer. 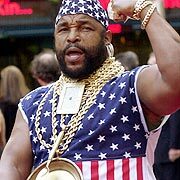 The one and only Mr. T (The A Team) has promised to never wear his trademark gold chains again as a tribute to the victims of Hurricane Katrina. A nice gesture in and of itself- but T has also been donating clothes and money to Katrina victims. How much can one man give? T will be seen helping the needy this fall in a new reality series airing on TV Land, called I Pity the Fool. 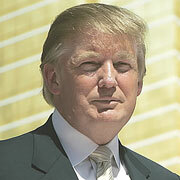 Donald Trump, star of The Apprentice, will make an appearance on NBC's Days of Our Lives. An NBC sopkeswoman crows that it's his daytime soap opera debut. Whoopee. The episode is set to air Oct. 24. More high concept gimmickry from FOX: follow a group of six friends over 20 years – one year per episode. The twist: one friend kills another at some point. Who becomes worm food? And who does the deed? The network hopes you’ll tune in weekly, as these characters attempt to overcome a clichéd story, big hair and songs ripped right from VH1 Classic’s We Are The 80’s. They do, somewhat; it ain’t half bad. But with maybe the worst timeslot on TV (against CSI and The Apprentice) it’ll be fighting for scraps. Which means this Reunion could be the last. Reunion airs Thursdays on Fox.